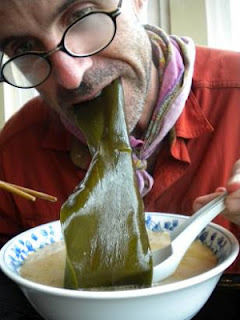 Wakame - big, green, and delicious! As someone who regularly visits farmers markets here in Japan, eats at an inordinate number of local izakayas and ramen shops, and works at an organic farm in Tokyo, I meet any number of new foods on a regular basis. Sometimes, when presented with an object that looks entirely unfamiliar with a smell I normally associate with food gone bad (think of the oh-so-slimy and so-good-for-you fermented soy beans called natto) I shy away. It's a natural instinct to be slightly afraid of what we don't know. After all, it is one of the ways species survive. If it's unknown, it might kill you or help you. How to decide? Carolyn R. Krouse's A Guide to Food Buying in Japan is one way to begin learning about the food around us and make tentative forays into the unknown. It's short and sweet, and a great springboard for shopping, eating, or just general wandering on the shotengai (shopping street). Read my full review over at eco+waza and fear no more!